Rare random drop in Mechamatic Guardian zone (both group tasks and solo tasks). Took me 8 instances to get mine, finally dropped today. The item DOES still drop. Got mine this evening. First one in at least 100 clearings of the entire zone. Got it on the 3rd floor (or 4th. Whichever the Mark III takes you to.) Dropped off a random trash mob. A steamwork shockblaster dropped the goods. Can drop off anything really just a rare drop. ive gone many weeks without one dropping and my best was 2 in one hour but that is very rare usually I go weeks if not a month before seeing one drop. Very nice item there other shrinkies but I like the fast time on this and it can be cast on others. Ive seen it drop ever level in the instanced although stick to the 3rd and 4th mainly for better xp. Heard this was a good place to solo for a monk. Dropped off the sixth mob I killed after zoning in. Have been swarming in the mechamatic guardian for a looong time. Got my sk from 93-95 here, got two of my friends 65-85 in here, 3 of my alts 65-85 in here, thousands of aa's in here. I'd estimate 15k-20k kills in this place and I loot every single one of them. The first time I saw this was about 3 minutes ago. Got it in the "head into" task from the gnome guy. Just a note. I've been swarming this zone with my SK, just the free range zone under "head into" task. I've cleared the zone from ground floor to top to bottom again, with out exaturation, 27 times. No shrinky device. Hopeing murphys law takes over and I get it on the next clearing. Might try an actual task zone next time. The ac aug rotted 12 times and the hp aug 14. Edited: 36 clearings. 18 ac/hp augs and 21 hp/mana augs. still no clicky shrink. Just got it from one of those 'Stone Cloud' mobs in the static instance, not a misson. Oh, was in the quest "head into". Just dropped on the 4th floor, off of a steamwork mob. I box here a lot and this is first time I've seen this drop. Must be rare. I have now had 3 of these drop. I request the plain old "head into" task from the gnome in the tent, and I swarm kill the floor with the Guardians Expediator Mark I on my SK. I didn't take note of the mob it dropped off of for the first kill, but this last one was the swirling soots. I need more information about this item. Over the past week I have spent well over 20 hours in this zone, have gained/glyphed over 100 AAs burning mobs down, trying to get this item. Mainl I have used the regular instance, exploring the mech guardian. I have seen 3 30 ac 75 hp augs drop during this time. I need the following info on where you got your humaonid reductionizer. 2. Level of the mech guard? I just want to find out if this is a zone wide rare, if so I will camp just the top area of the mech guard. Has anyone seen one of these drop in the very top area? Thank you for any added information. 2. Level of the mech guard? I have seen this item drop all 3 times on the first level of the guardian. Looted 8/6/09 from a steamwork reaver after countless repeats of Engine Room task. Got one this weekend from the standard Task: "head into" the task with repopps. Has been in the first room where you can see the brain, next room after the last elevator. Dropped from a standard robot-model, but don't remember the name of the dropper. this is a zonewide rare (as is the invis clickie from MG). i looted mine off one of the beetles, don't remember the exact name. it wasn't too far from the second teleport pad area, near the NPC boar that you guide in "the steamwork you're looking for" task. 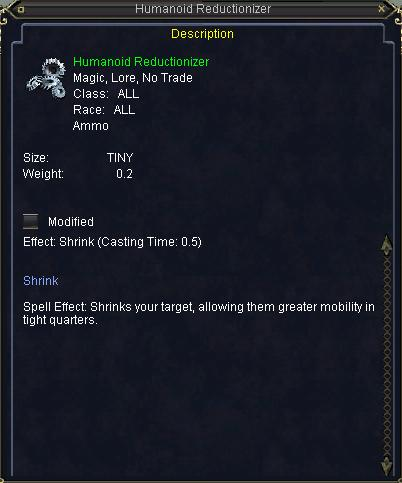 you can cast this on others in your group, unlike the shrink wand from Luclin which is self only. Dropped off the confirmed skitter rats but for me last night I got it in the room after the FIRST elevator from zone in. Clearly a zone wide random drop off this type of mob. Got this last night from 'a coilwork spitter' on the 3rd floor. Snake model. Spent a ton of time looking for rats, then right before I left, this dropped from a snake. This dropped in the adventures mission, Very top of Robot where the Beetle that drops the AC aug spawns. The mob that dropped it was a Steamwork Shockreaver - Robot model. So its confirmed zone wide rare, i spent about a week and half in there grinding this zone before and after raids, so if you get this drop fast you are one lucky SoB. I can confirm this drop sfrom skitter, perhaps its just random of any rat model? So far everyone I know that does have this , which is only three people, said they received it from a rat. was a nice surprise from the first skitterer when you come in.